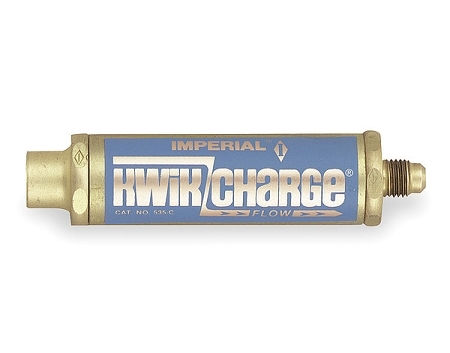 The Kwik Charge® charging unit accepts liquid refrigerant from the cylinder and discharges into low side of the system. Charging rate is up to eight times faster than vapor charging. In addition, liquid charging is required when using R-410A and other blended refrigerants. Attach the Kwik Charge device to the low side of the charging manifold. Charging hose is connected from Kwik Charge device outlet to low side of refrigeration system. Internal metering element reduces liquid flow to a level below capacity of compressor, assuring a safe, fast charge without endangering the compressor. A built-in ball check valve automatically opens when drawing a vacuum to assure rapid, unrestricted evacuation. Can be used with all fluorinated hydrocarbon refrigerant systems. 42 TruReward$ points will be placed in your account when you buy this item.